The Insolent Willies are led by Mohawk Valley singer-songwriters Bill Ackerbauer and Frank DeVer Pullen. 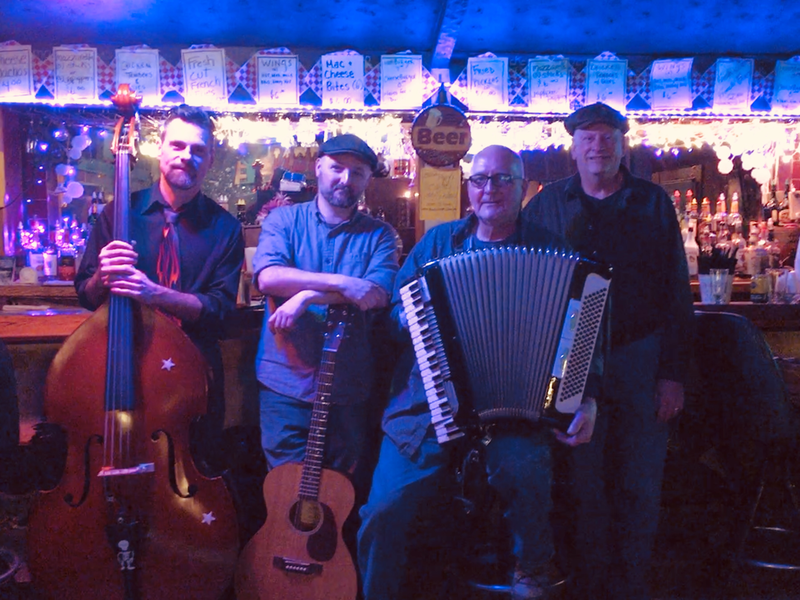 They play shows as an acoustic duo, or as a full band with the likes of Paul Gavry (accordion, fiddle) and Dave Tower (drums), and occasionally Mike Gowans (guitar) and Tom Russo (keys, percussion). The Insolent Willies draw inspiration from all over the musical map, and their shows feature original songs as well as covers spanning rock, blues, vintage country, reggae, soul, pub songs and more. The band is available for shows at taverns, clubs, festivals and private functions throughout upstate New York and western New England. For booking, contact Bill at (518) 210-6181 or e-mail billackerbauer(at)gmail.com. Jan. 5, 2019 ... Centre Street Pub, Schenectady, NY ... 9 p.m.-1 a.m.
Jan. 25 ... Stump City Brewing (acoustic duo) ... 5:30-8 p.m.
Feb. 2 ... Ground Hog Bash at Red Shed Brewery ... 7-9 p.m.
Feb. 9 ... Stump City Brewing ... 3-6 p.m.
Feb. 17 ... Meadowbrook Saloon, Glen .... 5-8 p.m.
Feb. 23 ... Stump City Brewing, Gloversville (duo show) ... 4-7 p.m.
March 1 ... An Evening of Animal Songs fundraiser, Johnstown ... 7-9 p.m.
March 17 .... Meadowbrook Saloon, Glen ... 5-8 p.m.
​March 23 ... Stoney’s Irish Grill, Schenectady (acoustic duo show) ... 7-10 p.m.
April 13 ... The Brass Monkey, Gloversville (acoustic duo show) ... 7-10 p.m.
May 11 ... Johnstown Midsummer Concert Series fundraiser (private event) ... 7-10 p.m.
May 24 ... Cooperstown Beverage Exchange ... 8-11 p.m.
May 25 ... Private function. May 31 ... Stump City Brewing, Gloversville ... 6-9 p.m.
June 1 ... Southern Adirondack Wine & Food Festival, Gloversville... 5-8 p.m.
June 21 ... Private function. July 13 ... Cooperstown Beverage Exchange ... 9 p.m.-late. July 26 ... S&S Brewing, Nassau ... 6-9 p.m.
July 27 ... The Snowed Inn, Broadalbin (acoustic duo show) ... 8-11 p.m.
August 2 ... Lake George Beach Club (acoustic duo show) ... 5-8 p.m.
August 3 ... Green Wolf Brewing, Middleburgh ... 7-10 p.m.
August 10 ... Cooperstown Beverage Exchange ... 9 p.m.-late. Aug. 23 ... Middleburgh Street Fest ... 5-8 p.m.
August 29 ... Centre St. Pub, Schenectady (acoustic duo show) ... 7-10 p.m.
Sept. 28 ... Benefit for Veterans, St. Johnsville, NY ... 1-3 p.m.
June 28, 2020 ... The Westy, Ithaca ... 7-9 p.m.